For this blog post, I received compensation and a complimentary meal from Carrabba’s Italian Grill, but all my opinions are my own. Do you like Italian food as much as I do? Well, my son and I just had an opportunity to try some of Carrabba’s new menu items and they are amazing. 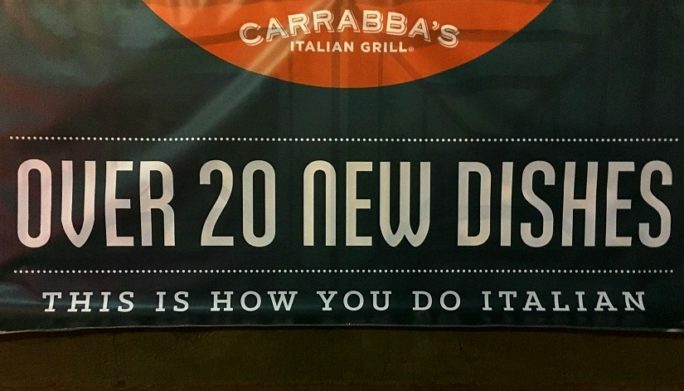 And Carrabba’s wants you to try them too. From now to January 14, Carrabba’s is offering a 1 Million Meal Giveaway. All you have to do is visit Carrabba’s website and sign up for a free Carrabba’s dish. Plus, today through March 6, you can get 20% off of every bill. Pretty awesome! 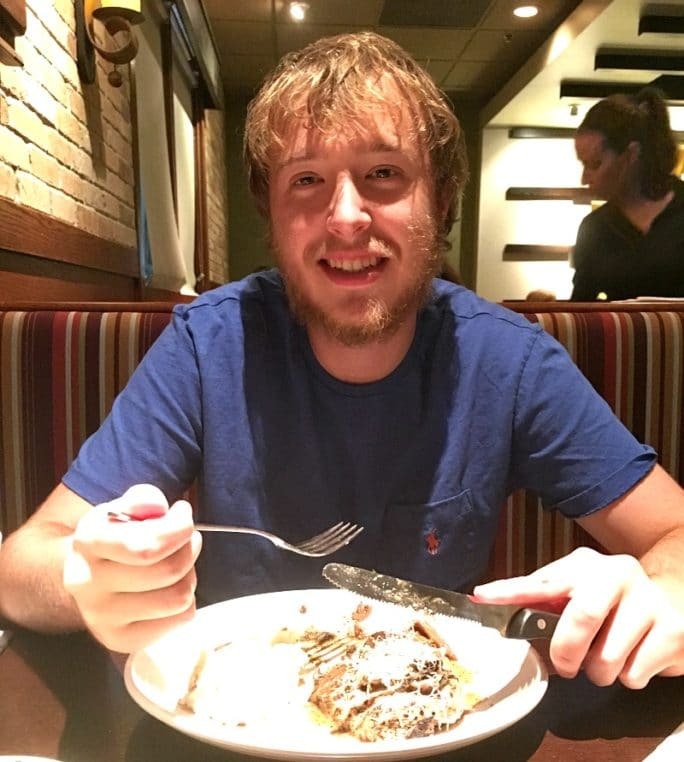 I have been really spoiled by having my son home from college for almost a month. When you have an 18 year-old, you don’t always have many opportunities for spending quality time with them and that makes sitting down and sharing a meal with them all the more special. And to get to enjoy some really amazing food (that someone else cooked!) just makes for an even more enjoyable experience. Carrabba’s Italian Grill has just launched a new menu featuring 20 new menu items. Don’t worry, all your favorites are still on the menu. My son couldn’t resist ordering his beloved Chicken Marsala. The new menu items have a more modern Italian feel but with the same fresh ingredients and quality that Carrabba’s is known for. 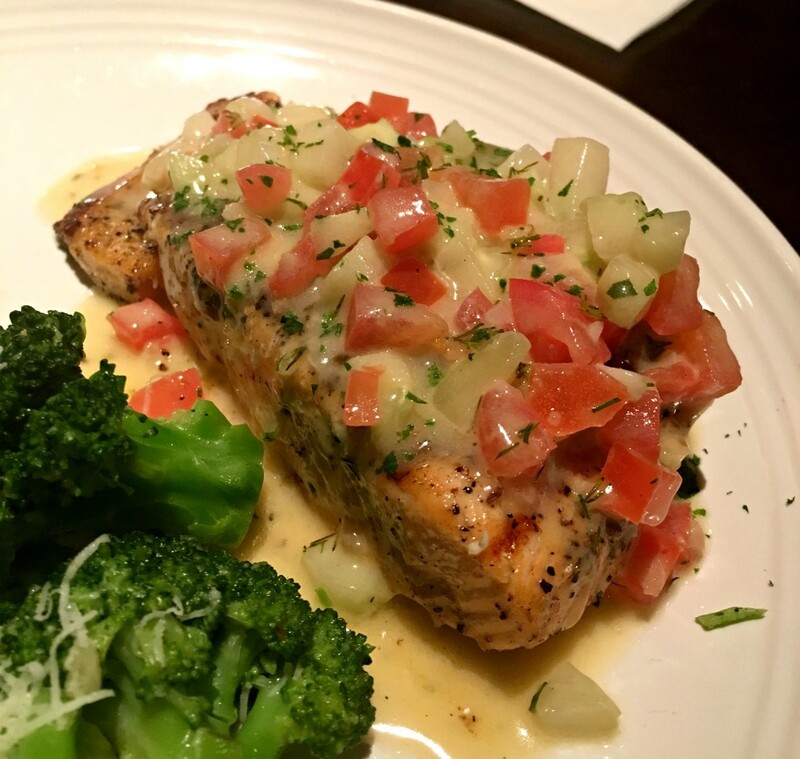 There is so much more to Carrabba’s than just great pasta. The new menu offerings include wood-fired pizzas, small tapas-style plates, seafood, and more. Many of the new dishes have a lighter, more Mediterranean feel than the more traditional dishes. 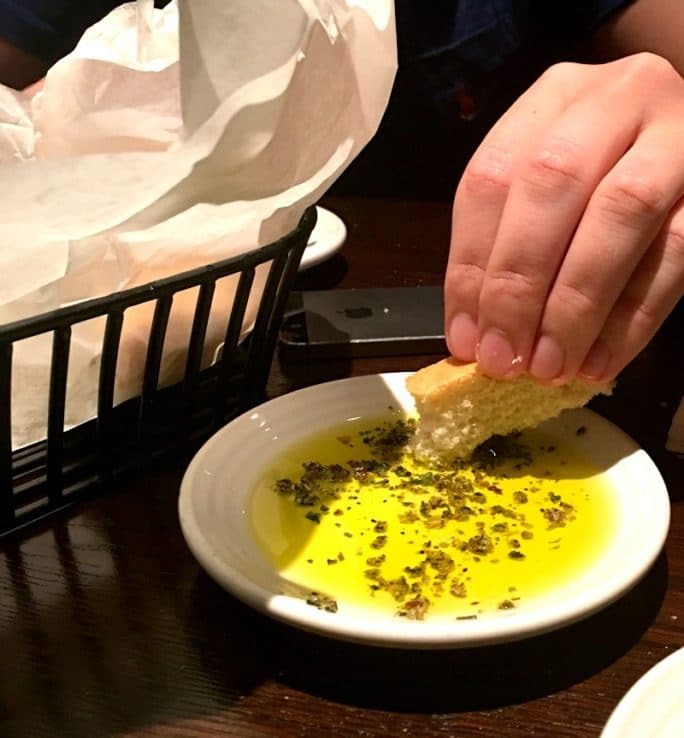 When we go to Carrabba’s, I would be perfectly happy to just eat bread. That dipping oil is so good! 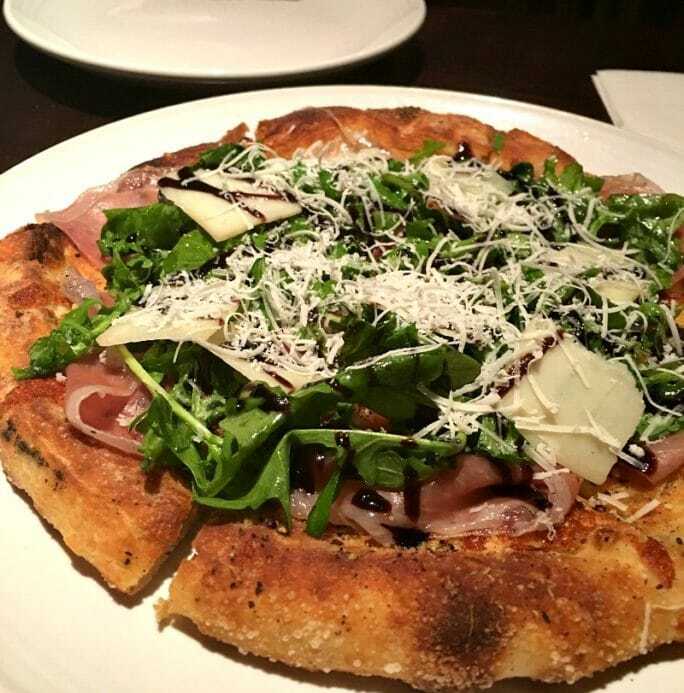 We started our meal with the new Prosciutto Arugula Wood-Fired Pizza with shaved Parmesan and balsamic drizzle. The crust on this pizza was amazing and just look at all that yummy prosciutto! New Appetizers on the menu include Shrimp Scampi, Tomato Caprese with fresh Burrata, and Wood-Fired Italian Wings. These Italian Lettuce Wraps were my favorite out of all the things we tried. Wood-grilled chicken tossed with vegetables and ricotta salata in a Mediterranean lemon vinaigrette. Served over romaine lettuce, drizzled with a port wine reduction. The flavors are so fresh and the chicken was incredibly juicy. I can’t wait to have these lettuce wraps again. 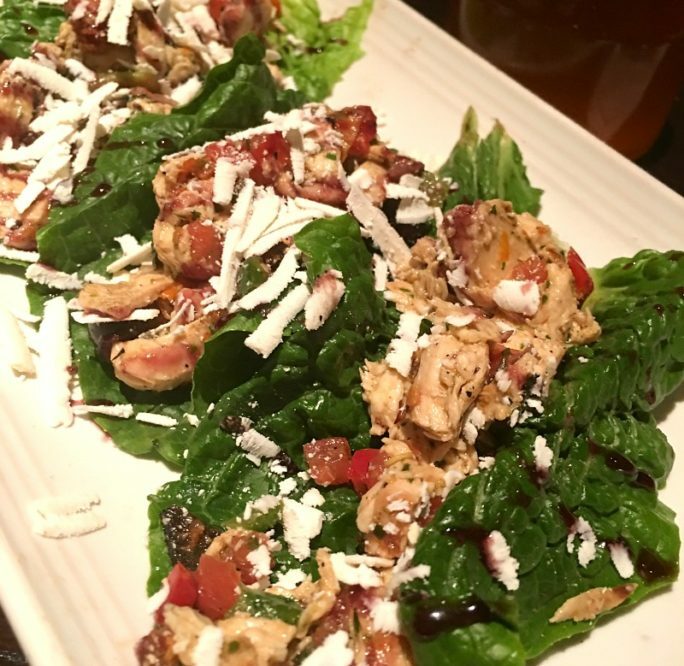 The Italian Lettuce Wraps are one of 6 items on the new Small Plates Menu which is designed to be shareable or to mix and match to create your own perfect meal. They are very, very reasonably priced too. Meatballs and Ricotta simmered in pomodoro sauce with Romano cheese. I’m in love with these meatballs and the sauce is so good. We practically licked the dish clean! 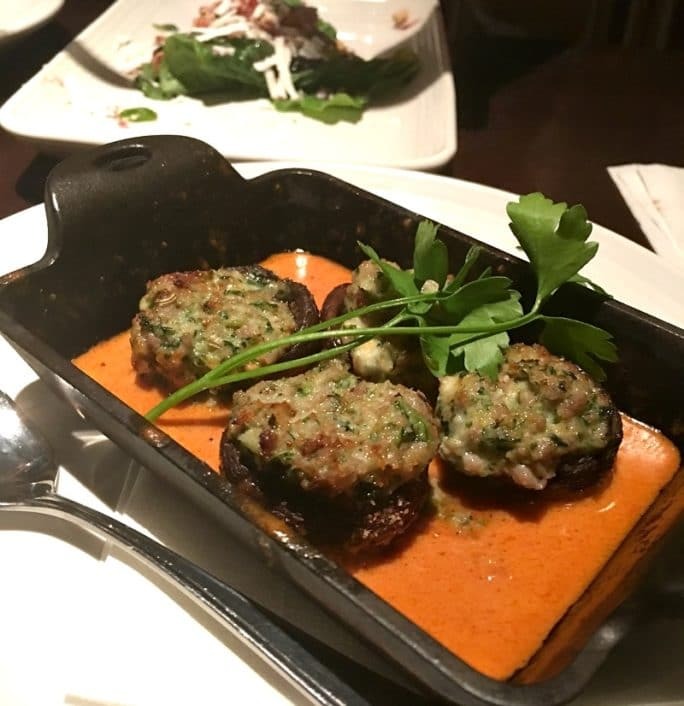 Three-Cheese and Sausage Stuffed Mushrooms served over tomato cream sauce. I don’t know what it is about stuffed mushrooms, but I can never resist them! The other 3 small plates items are Bruscette Siciliani, Grilled Asparagus with Prosciutto, and Mozzarella Rustica. For my entree, I went with the new Salmon Cetriolini which has diced tomato, cucumber and dill in a lemon white wine sauce. This dish tasted so light and fresh, but had an incredible amount of flavor and the salmon was cooked perfectly. I’m going to have a hard time not ordering this next time I dine at Carrabba’s. For dessert we had Brulee Ricotta Cheesecake and Raspberry and Chocolate-Hazelnut Gelato. 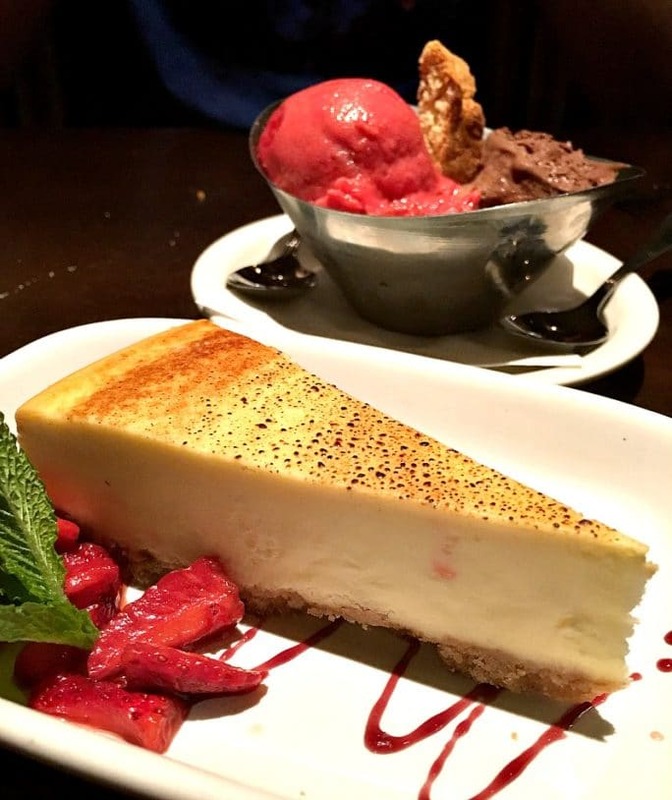 The cheesecake looks simple and plain, but the flavor is so delicious and different. Not only do I love the food at Carrabba’s, but I love the warm and inviting ambiance. The open air kitchen gives it the feel of one of those really expensive, upscale restaurants. I love that you can have a special occasion meal at Carrabba’s that is memorable, but still very affordable. Be sure to get your free Carrabba’s dish in the 1 Million Dish Giveaway and don’t forget- 20% off of every bill thru March 6. Click the links above to take advantage of these deals. Okay, I NEED to go to a Carrabbas asap! 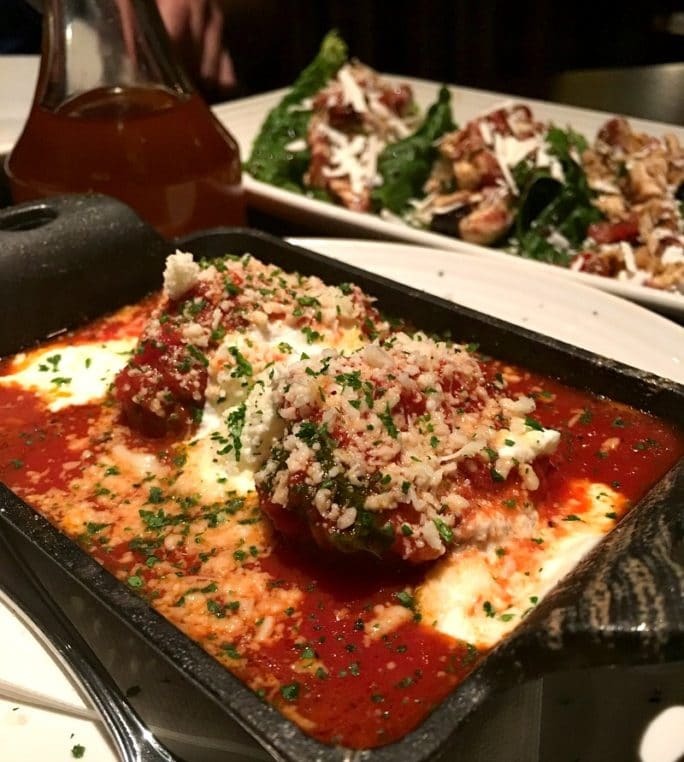 I seriously cannot stop drooling over your amazing meal, especially those meatballs and ricotta! Carrabba’s has the most delicious dinners and the best atmosphere and wonderful friendly service! I love me some Italian food!! i’ll have to go try the new menu out! Oh my goodness — that all looks amazing! I am a sucker for Italian food of any kind! I’ve never actually been to Carrabas because there aren’t any near me in Chicago (go figure!) but I always see their delicious commercials. Everything looks fantastic, Christn! Especially that cheesecake. I’m going to have to hunt down a Carrabas in my area! We don’t have a Carrabbas anywhere near me, but my mother is obsessed with that place! I’ll have to forward this link over to her. 😉 So glad you got to enjoy time with your son over a nice meal! Cheers, my dear!